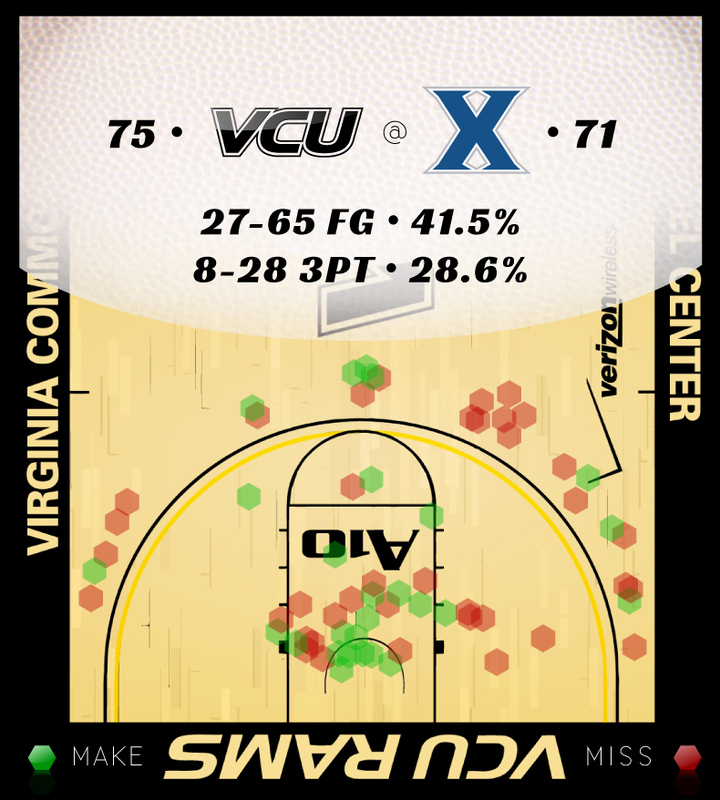 VCU 75, Xavier 71…Or, How Do You Like Me Now? With 26 seconds to play and VCU nursing a 71-68 lead over Xavier, Rob Brandenberg stepped to the foul line. The Rams had overwhelmed the Musketeers in the second half, answering the crossword puzzle clue to 17-down. But before VCU could write H-A-V-O-C into the boxes and celebrate an uplifting victory, Brandenberg had to attend to the final business. It's no coincidence, nor happenstance, that it was Brandenberg toeing the 15-foot line. You see, Brandenberg grew up in Cincinnati and went to high school at Gahanna in nearby Columbus. His mom and about 20 others were in attendance. And 15 seconds later, with VCUs lead just two points, Brandenberg again stepped to the foul line. Christon attempted a heavily-guarded three pointer, the rebound found Brandenberg. deities, in the hands of Rob Brandenberg. He came home and showed them all something. This is what good basketball teams do. It's worth noting that for all the stress and all the catching up, VCU did not trail the final 4:41 of the game. Good teams throw counterpunches. They are mature enough to know and understand the other guy is going to make plays. The key is to maneuver enough to begin your assault before it's too late. VCU threw a haymaker. After a Semaj Christon steal and dunk established that 17-point lead, it took 45 seconds to change the game. Troy Daniels hit back-to-back threes and you looked at the clock and saw an 11-point deficit with 18 minutes still on the clock. You knew it wasn't over. heads. Davis, Xavier's best ball handler, would not return. Credit the VCU coaching staff for an adjustment at that moment that altered those final 13 minutes. Christon was the only ballhandler left for the Musketeers, and he was an iffy choice at that. VCU tweaked its press and double-teamed Christon so he could not receive the inbounds pass. Xavier was forced to throw the ball to Brad Redford, a great shooter but substandard ballhandler, or a big man. in 1:44, fueled by that press tweak. That's when the world intervened and put the basketball in Rob Brandenberg's capable hands. Brandenberg showed "them" something, but so did the entire VCU basketball team. There was an expected level of hubbub on the ride home. This team and its coaches know and understand what it accomplished and what it means. This was a big one for many reasons. However I wouldn't describe the mood as joyous, and there was certainly a minimal level of satisfaction. This team knows what we all know, really. That we are 22-6 but a team that’s far from polished, a team that can get better. VCU is now 10-3 in the A10, a half-game behind St. Louis for first place. Butler–in case you hadn't heard the Bulldogs visit The Stu on Saturday–are a game back of VCU at 9-4. LaSalle sits one and one-half games back of VCU at 8-4. Then it's Xaiver at 8-5 and Temple at 7-5. LaSalle is at Rhode Island and Temple travels to 6-5 Charlotte today. 11-14; then 3-9. Of 14 first half field goals, Xavier made 11 layups or dunks. In the second half, the Muskies were held to three point blank makes. school record for made three-pointers in a season. Daniels has 99.
led to a massive 23 more field goal attempts for VCU. 10 turnovers on the day. turnovers in a game, and 14-0 when Branenberg scores 11 or more points. 12 and 14. With 12 steals on the afternoon, VCU is now 14 shy of the A10 record. It became very frustrating in the first half when the Rams ran very crisp offensive sets, got the exact shot they wanted, and fired up a brick. There's nothing that can be altered–you just have to make shots. Drives me nuts to see VCU play well and get zippo out of it. Or, if you aren't making shots are you playing well? Discuss. On defense, we continue to see the value of Darius Theus. He was the reason the defense was better in the second half because he was on the floor. One of his fouls was a silly reach 30 feet from the basket. We've got to be smarter with those fouls, especially if officials are going to call a game close. ***Rob Brandenberg. You score 10 points in 12 minutes in the second half. You nail four free throws late. You are the man. **Troy Daniels. Give his cranium a pat on the frontal lobe. Daniels was 1-7 from three in the first half but came out firing in the second half. Smart ran two specific plays to free Daniels later in the half and both worked to perfection–and Troy buried them both. Ahem: Troy had four steals. *Darius Theus. You may see two points and wonder why Theus over Graham. I see four assists and zero turnovers, but also game impact. Xavier did not run backdoor and generally run amok in the second half with Theus bodying up Christon and shutting down drives. That cool stat above about layups and dunks? Credit Theus. Honorable Mention: We see you, Freight Train. 17/6 plus a gargantuan three are noteworthy.